We love to design elegant Christmas designs! The designs in the Victorian Christmas collection are no exception. There are 20 different jumbo designs included in this collection and they all have an enormous amount of detail. Our artists went all out when drawing these designs and each one is a piece of artwork in itself. There are beautiful scenes adorned by flowing holly leaves, many of the designs even contain heartwarming sayings. You will be sure to cherish these designs for years to come. Each of the jumbo designs comes in multiple sizes. 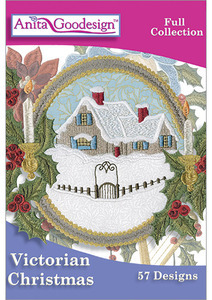 There are also 19 different edited designs in smaller sizes that you can add to any Christmas Project. There are 57 designs total for the 5”x 7”, 6”x 10”, and the 8”x 12” hoops.